Hidden abilities. Raw talent. Untapped creativity. These are just a few of the phrases that come to mind when we think of Josh and the person he was when he joined Dietrich Homes in June 2014. “Beautiful, abstract craziness,” is what other team members call it, and if you really need a label, that’s probably as close as you’re going to get. None if it does justice to Josh’s imagination or skills with a sketchpad, saw or welding torch. And, fact is, we don’t think he should be pigeonholed, anyway. After all, none of his creations can be. But first, a little history. Josh was working as a convenience store assistant manager, ringing up fuel, candy and soda purchases day after day, marking time by doing remodeling projects at the store and taking a little time here and there to visit with customers. One of those customers was a Dietrich Homes jobsite supervisor, and in June 2014, when we needed someone to run our shop, Josh’s name came up. We got way more than we bargained for, and we mean that in the best possible way. 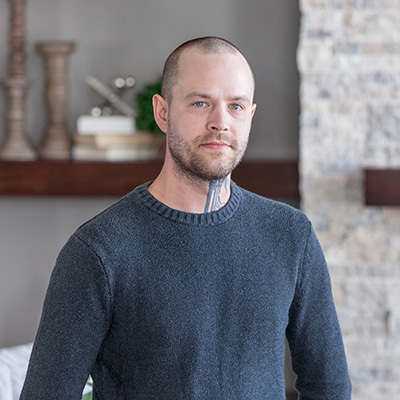 Josh has flourished as our lead fabricator of custom doors, stair rails, custom woodwork, parts of windows, tooled accents… no matter what it is, if we need something made for one of our clients or model homes, he can do it. Where he really excels is adding a touch of “different.” Show him a picture of something similar to what you want, and he’ll come up with something 15 times better. He took a bunch of leftover hardwood flooring and built an extraordinary waterfall desk for our CAD designer’s office. There’s the lifelike yet abstract tree bookshelf he cut and carved for our office lobby. Then there are the wine racks, cabinets and other Josh originals, made of everything from scrap wood to scrap metal, that we put into every one of our model and custom homes in the Fargo-Moorhead Parade of Homes. Suffice it to say that Josh is an incredibly talented, really nice and down-to-earth guy who likes people he can learn from and who can give him a surprise from time to time. Given that we’re often drawn to people like ourselves, that’s just about right.